Two Brothers is the farewell release from Abunai!, who have unfortunately disbanded. The band excelled at both song-oriented psychedelia and mind-bending space rock workouts, and this 12" vinyl EP will appeal to fans of both sides of the band. The EP is the fourth release from Camera Lucida, the special projects arm of the great Camera Obscura label (the previous release was Abunai! 's "Deep Mu Flux+2"). 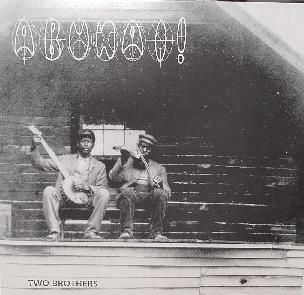 Side A includes "Two Brothers", a folk-psych song that blends traditional influences with floating and acidic psychedelia. The folk song and aggressive elements blend beautifully and are supplemented by guests on flute and acoustic guitar, including Cheryl Wanner's gorgeous vocals. "Lord Hampton" is a short song recorded live at the Terrastock IV festival and is a more aggressive rocking acid-psych song. But the real magic of the album is the 15 minute side B magic carpet bong ride version of "Two Brothers" that takes the listener on a trip to the deepest and most star filled reaches of space. The guitars drift, pulsate and soar, creating rushing cosmic waves of psychedelic sound, embellished by the folk elements that the flute, acoustic guitar and chants provide. The bass has a deep Dub rhythmic pulse, and James Whitaker's spoken word bits remind me of the old Moody Blues narrations. Truly beautiful and totally trippy. It's sad to think the band won't be recording any longer but I'll be looking forward to whatever the various members move on to next. For more information you can visit the Abunai! web site at: http://www.abunai.com. Two Brothers is distributed by Camera Obscura. You can visit their web site at: http://www.cameraobscura.com.au.